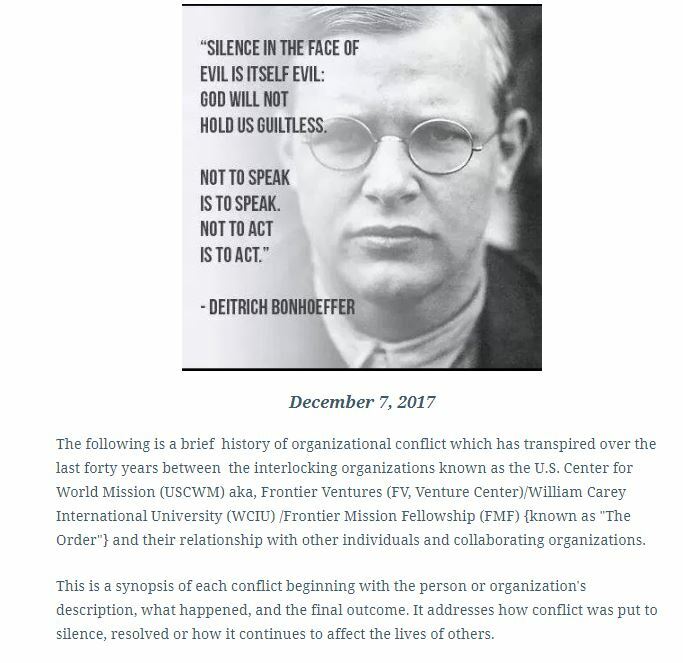 This is a synopsis of each conflict beginning with the person or organization’s description, what happened, and the final outcome. It addresses how conflict was put to silence, resolved or how it continues to affect the lives of others. Not all stories are fully known as the mission community holds to a code of silence. The list of incidents while not conclusive, demonstrates that a bitter root which is hidden and remains unrecognized by wise elders will only grow and bear much bitter fruit. We must all examine and test and evaluate ourselves to see whether we are holding to our faith and showing the proper fruits of it. NKJV Hebrews 12:14-16/Amplified Bible 2 Cor. 13:5. Knowing this, what type of people are we to be? YHWH’s set apart people, holy people. And yet, like Isaiah, I feel “woe is me, for I am a man of unclean lips among a people of unclean hearts.’ Rarely today have Elizabeth and I found friends who have not suffered from divorce or infidelity or some besetting sin, even in the body of Christ. It is a difficult day. During my early walk with Master Yeshua, I recall being deeply distressed when I began to see all of my sin. All of a sudden my despair was replaced with great joy as I realized that I could only see it because of the abiding work of the HOLY SPIRIT in my heart. At times, I grasped realities that I would share with other believers such as, “Can you believe it! Jesus is ALIVE! I mean, REALLY. He is not in the grave! He is ruling at the right Hand of YHWH and will return!” The expressions on their faces betrayed their hearts. “Yeh, so.” WHAT?! I mean this changes everything! He is raised from the dead! He is our KING. I began to see back then, that the Church was lukewarm. I didn’t come from a lukewarm Buddhist sect. We were zealots. How could I be any less zealous for my Savior Yeshua Ha’Moshiach, Jesus Christ of Nazareth? We wrote tracts that spoke of our decision to follow Jesus. We discovered on short order, that there was a Devil, and he was YHWH’s adversary. Our first outreach in Santa Monica involved handing out literature to thousands of my former Buddhist friends who were attending a Buddhist parade. The night before our outreach, it seemed that all the forces of hell were unleashed as our son threw up on our bed, I got sick and gang members were attempting to break into an apartment above ours. We were apartment managers at the time as well. We didn’t let it stop us, but went out and shared the Gospel. I got miraculously well while witnessing. While some of them have come to the LORD, I have recently discovered that many of them have passed away which has grieved me. It has also intensified my resolve to return to my first love, Yeshua and do the deeds I did as a young believer. After our conversion to Jesus Christ in 1984 which coincided with the Olympics in Los Angeles, we felt compelled to share the Gospel with our Buddhist friends. After taking “Perspectives on the World Christian Movement” we discovered there was a gaping hole in the Christian Movement to reach the Buddhist world and were challenged by Ralph Winter to do something about it. After much prayer and searching for a mission agency who worked among Buddhists we discovered there few doing any serious outreach. At about the same time in Pasadena, a terrible murder occurred of Lois Haro, the daughter of Elsie and Herb Purnell who had been missionaries to Thailand and were working at the US Center for World Mission and William Carey International University. Lois, a newly married bride was abducted from the Pasadena Plaza at gunpoint, taken to the Rose Bowl, raped and shot to death. 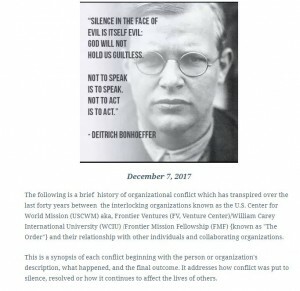 As a result of her tragic death, a cry for prayer went out in Mission Frontiers entitled, “Make Satan Pay for this one!” It called for prayer for the establishment of an organization that would focus on reaching unreached Buddhists around the world. Prior to that the LORD Jesus had placed a burden on our heart for the establishment of a work to accomplish the same goal. In 1996, when the Dalai Lama came to Pasadena, he was given the Key to the City by the Mayor, a sand mandala was built at Pacific Asia Museum, and the Dalai Lama spoke to 3,000 Chinese Buddhist leaders from all over the world. While it was a daunting spiritual task, we knew we were called to share the Gospel and pray against the onslaught of Tantric Buddhism in California. While some Christians were very supportive, even financing the production of “Mankind Needs a Savior” which included the testimonies of four former Tibetan Buddhists and a Gospel message; some Pastors were resistant and suggested that it was not their responsibility to address since there are four hundred cults that come through here a year. A small group of former Buddhists recognized our responsibility to engage in covering the city. During our interview of the Tibetan lamas that were building the sand mandala, they told us that they had to conduct prayers to prevent their own demonic possession since they were doing ritual that invited 722 deities to take possession of the territory where the sand mandala was built. Bernie W. formerly a Buddhist from Sri Lanka taught us how to pray authoritatively over the Pasadena Civic Auditorium, the venue where the Dalai Lama was to conduct ancient rituals and give talks to the Buddhist community and at the Distinguished Speakers series to the general public. After the 1996 outreach and spiritual initiative, all of our teams suffered from serious backlash. That is a very, very long and complex story. Many painful lessons were learned. But, Satan did not stop YHWH’s agenda. I read John Owen’s “Sermon to the Nation” delivered on April 20, 1649 before the Parliament on a day set aside for extraordinary humiliation that should link our heart to the soul of the historic blood washed covenant community. We must ask ourselves, “Are we fulfilling YHWH’s burden and purposes for our generation? Will we be ashamed to stand in the presence of our King before such an audience of faithful men and women? Will He say to us, “Well done, good and faithful servant?” These are questions we must ponder in our generation. I witnessed martyrdom in America when I received a call to a hospital to identify the body of Wally Tope, a Christian brother who was struck down during the LA Riots in 1992. We live in a serious age, which calls for men of faith willing to take unpopular stands in the face of evil. 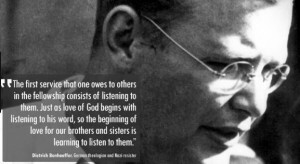 Wally was well known for his in-depth counter cult apologetic research on Mormons and Jehovah Witnesses which he produced incredible tracts from that lead many into the light of the Gospel of Jesus Christ. Wally was called to preach in the hard places and had been working on a research project on Tibet at the time and had my card on his person. That day I heard from the LORD that this was the beginning of many martyrs in America. So where are we TODAY JUNE 20, 2011? Do we see YHWH’s Hand in turning kingdoms upside down? He has promised “His church that he will give unto it holy priests and Levites, Isa. Lxvi.20, 21, which shall serve at the great feast of tabernacles, Zech. Xiv.16.” The kingdoms of this world shall become the kingdoms of our Lord, Revelation 11:15. Are we walking as His sons and daughters in truth and obedience? Don Upham, a former Navy pilot who served as a Firefighter, Paramedic, Captain, and Battalion Chief with the Los County Fire Department believes that “The Ancient of Days will pass judgment in favor of the Saints…When the Saints begin to take possession of the kingdom!’ according to Daniel 7:22. In 2003, I worked with Don while addressing “The Circle of Bliss: an art exhibit on Buddhist meditational art” at the LA County Museum of Art. Years early when I was a Buddhist, I had performed in a Buddhist brass band in the same exact place that the sand mandala was being constructed. I confessed my sin in helping lay the groundwork for these Buddhist events in my young days as a Buddhist radical. http://www.worldviews101.com for more indepth coverage in our twelve lesson course which focuses on a Christian perspective on the Dalai Lama and Tibetan Buddhism). During the process of our work together on a series of events that were being spawned from the Dalai Lama’s visits including An International Buddhist Film Festival, Sacred Music Festival inaugurated by the Dalai Lama in Los Angeles, etc., Don and I worked through many levels of strategic spiritual warfare. He ended up being instrumental in answering the question I had about the Dalai Lama’s activities in Pasadena back in 1996. 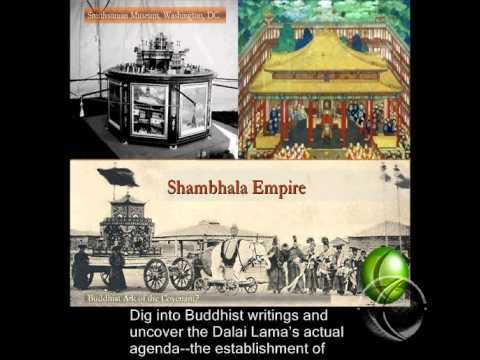 Don recognized that we had to dig deeply to uncover the root iniquities that gave the Dalai Lama permission to conduct his ceremonies in Los Angeles. We learned the power of answered prayer when no one else seemed to want to listen or assist in the battle. His spiritual model which is thoroughly discussed in his excellent book In Favor of the Saints. Don openly speaks of the spiritual battle and struggles he had in understanding what the LORD wanted him to do with what he was witnessing in his own life as he grappled what it would look like to walk out the purpose of God in his generation. First of all, YHWH has an agenda and we are involved in an ongoing battle with Satan, the dispossessed god of this world. YHWH wants us to learn to walk in the authority that He’s given us. Don drew on his experiences in Latin America in the Argentina revival and his growing experience of spiritual authority as a Christian working for the LA County Fire Department. The LORD showed him how worship changed the atmosphere over an entire territory as he sang over the territory assigned to him. Fires diminished. He worked on difficult assignments dealing with toxic chemicals as well and recognized that the nature of the toxic spiritual rituals that the Dalai Lama and his priests were designing. But understanding the meaning and strategy of the enemy was not all. God wanted a canopy of worship established over the County of Los Angeles which would require prayerful teamwork and careful hearing the LORD. He began to see that there were multiple dimensions of warfare and in this the LORD began unveiling the sins that had opened the doors for Tibetan witchcraft. The LORD also began revealing how institutions that had fallen had broken original covenants that were honoring Jesus Christ and the faith. Christians began uncovering these at Claremont which was a beginning. On one day, I participated in the raising of the Canopy over Los Angeles and with a team of about five people prayerfully asked the LORD Jesus Christ for His Holy Scriptures that we could write on a tall fence stake which we pounded into the ground as one of the stakes to hold up the spiritual canopy over Los Angeles. It had become the LORD’s answer to Satan wishing to strengthen his dominion over Los Angeles through the Buddhist sand mandala. Shortly afterwards, we discovered that another mandala had been made. While we were in Hacienda Heights praying, one of the prayer warriors who was a son of a Central American President who had been assassinated by a bomb and had escaped afterwards to he United States where he came to faith, came up to me and said the LORD Jesus who saved me showed me your face in a vision. And here we are. There is much work to be done. It is but a beginning. Shortly afterwards we prayed and also prayed over an area where a Latin American woman evangelist had been martyred by Satanists and dragged behind a truck and dropped off on Hacienda Heights blvd. An hour later we were praying in the neighborhood over a house that we felt was a nest of evil. We were invited in and the house was full of every conceivable devil mask from around the world. The four of us testified to him about the power of Jesus Christ to set him free from his sin and were allowed to pray for his salvation. It was a powerful moment. He was the radio voice of a program on spiritualism in San Francisco broadcast out of Hacienda Heights! There is so much more on identifical repentance, the influence of Jack Parsons who worked with L.Ron Hubbard attempting to channel the Spirit of Babylon into Pasadena. The hidden meaning of the Seal of the City of Pasadena. So much material. Order the book, it provides an excellent experiential model of what was done complete with many biblical references. Here is the link to In Favor of the Saints website for the book which lists the Table of Contents and other information. Also has links on the website for purchase on line and another link to his publisher for purchase and download of a PDF format of the book. (I could use gatekeepers help on prayer requests on items. Please go to Facebook and join Facebook Worldviews101 group. We can share requests there. Thanks. Pray about the floods and nuclear plants on the Missouri and Mississippi. First the floods starting in Montana. Pray against the Tibetan tantric vases that have been buried in Helena, the State Capitol, in the Missouri, in Glacier National Park, Yellowstone. Repentance. Federal officials have determined that Sacramento has the highest flood risk of any U.S. city outside New Orleans, with some neighborhoods under 10 to 20 feet of water after a catastrophic levee failure. Last month, state and federal officials participated in an emergency drill to prepare for just such a disaster. The National Weather Service predicts this will be one of the top five water years in history in the Pacific Northwest, and the biggest since 1997, the last year of significant flooding, said Gina Baltrush said of the U.S. Army Corps of Engineers. I am the President (and a Board Member) of the Chicago-based NUCLEAR ENERGY INFORMATION SERVICE (NEIS), “Illinois’ Nuclear Power Watchdog Group.” It just so happens that, living in Council Bluffs, Iowa, I went to Dana College in Blair, Nebraska (in the vicinity of the Omaha Public Power District’s Fort Calhoun nuclear plant), from 1972-1976, and graduated with a Bachelor of Science (B.S.) Degree in Biology and Environmental Studies. While at Dana College, I testified at the licensing hearing for the Fort Calhoun nuclear plant—arguing against giving Ft. Calhoun an “operating license.” ( I spoke about the dangers of the ionizing radiation to be released by the plant.) The electrical fire that “knocked out” the cooling for the irradiated (spent) fuel pool there shows us that: NUCLEAR POWER IS A VERY COMPLEX, INHERENTLY DANGEROUS AND ‘DIRTY’ ENERGY TECHNOLOGY WHICH IS HIGHLY VULNERABLE TO A WIDE RANGE OF UNANTICIPATED MISHAPS!!! What we need is a “nuclear construction moratorium,” the immediate removal of ALL direct and indirect federal nuclear subsidies (including loan guarantees and the Price-Anderson Act), and a speedy phase-out of the entire commercial nuclear power industry. We need to aggressively pursue a “‘CARBON-FREE/NUCLEAR-FREE’ ENERGY PATHWAY”—the best technically and economically feasible way for us to get off of all oil without nuclear (or coal) within 30-50 years. What we are talking about is a 100-percent U.S. renewable energy economy by 2040-2050, being based upon these things: (1) Greatly Increased Energy Efficiency; (2) Combined Heat-and-Power; and (3) Appropriate Renewable Energy Technologies. The USGS report predicts that a major quake would create horrific scenes like something out of a science fiction movie, potentially cutting the Eastern part of the country off from the West in terms of vehicular traffic and road commerce.